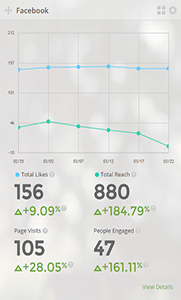 Turn your WordPress dashboard and Facebook data into stunning visuals with SkyStats! Data Usage Policy: Authenticating the SkyStats WordPress Dashboard Plugin grants the widget access to your individual Facebook Insights data. Once installed, your SkyStats’ Facebook Insights data will never be shared with any third party unless you grant access from the in-page widget. Also, SkyStats authenticates using Auth 2.0 method and saves the Access Token in the database to fetch the user’s Statistics. The file system that runs on your WordPress installation may cache some data locally. You may disable or purge all authentication and cache data from the plugin using the “Deauthorize” button at any time. 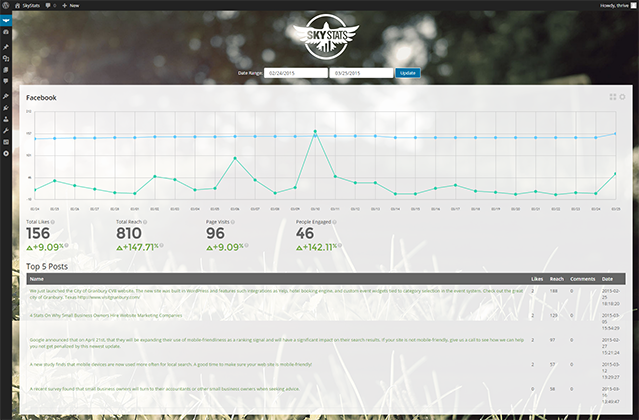 Want to see your stats take flight?